: Artist's concept of NASA's New Horizons probe flying through the Pluto system. New Horizons is the fastest space probe ever launched, and is wrapped in a layer of Kevlar to protect its internal systems from encounters with debris. Traveling through space at 34,000 mph (54,720 km/h) poses some risks, which is why NASA's Pluto-bound New Horizons probe is wearing a bulletproof vest. New Horizons is the fastest spacecraft ever launched. The probe has traveled more than 3 billion miles (4.8 billion kilometers) since blasting off in January 2006, and it's currently covering the distance from New York City to Los Angeles every 4 minutes or so. Traveling at this breakneck speed, even a minor collision could be game over for the entire mission. So the onboard computers and other systems are wrapped in a layer of Kevlar that should protect them from an encounter with a stray rock or a bit of debris. In this exclusive Space.com video, New Horizons Principal Investigator Alan Stern talks about the dangers facing New Horizons as it nears Pluto, and the steps the mission can take to avoid catastrophe. It is unlikely that New Horizons will have an encounter with a bit of debris as it approaches Pluto, according to Stern. But, he added, "We are flying into the unknown." Debris, such as small rocks, could come from Pluto's five known moons, which are occasionally impacted by meteors. When this happens, material from the meteors gets thrown up into the air, and the moons don't have enough gravity to pull the debris back down. Stern said the stuff eventually resettles on Pluto or a larger body, but a stray bit may be lurking in New Horizons' path. Members of the New Horizons team are on the lookout for debris, and can choose to redirect the probe if necessary. If a major piece of debris were on a collision course with New Horizons, the team could also use the probe's dish antennae as a shield (although these antennas are not covered in Kevlar). Doing so would significantly reduce the spacecraft's ability to collect and transmit data, however, so this strategy would be used only as a last resort. 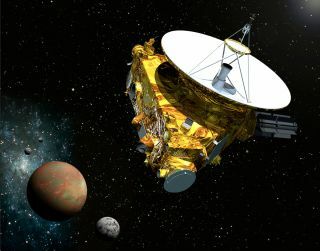 New Horizons will make its closest approach to Pluto on July 14, in the process becoming the first space probe ever to explore the dwarf planet up close. It will also collect data on Pluto's moons and look for additional moons that haven't yet been identified.